When you suffer a tag-related injury at Grandma's house, it's good to have a cousin to comfort you. 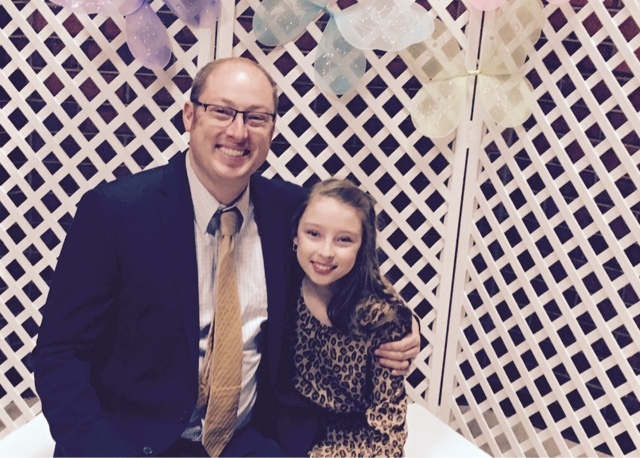 the daughters who love them. Best night of the year. Every year. The last few years, we've spent Martin Luther King Jr. Day at the Utah Grizzlies matinee game. Here's a quick recap of how it went down this year. 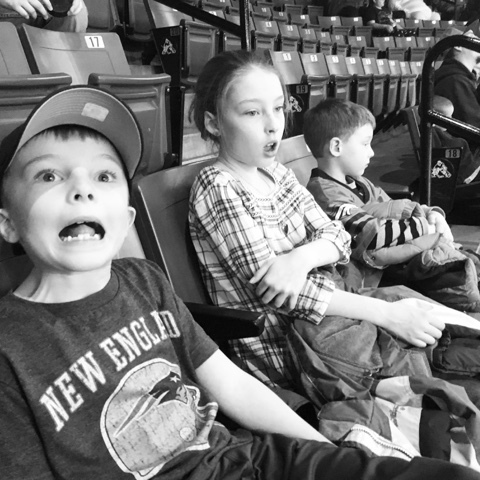 The boys like hockey, especially Tate, so they were pretty excited to go. Paige tolerates sports, as does Traci. Everyone was pretty good through the first two periods. Even Traci, who said, "There's only four minutes left?! This has gone by pretty fast." "Uh, but there's still another period," I replied. "But they already had halftime." I had to share the bad news that hockey games have two halftimes. Bummer, dude. That's when the wheels kind of fell off. During the second intermission, Curtis' ears perked up when they announced they'd be dropping cash from the ceiling. "I hope I catch $16 so I can buy a tabletop foosball set!" he said. Unfortunately, they weren't dropping $16 bills. And the falling singles fluttered right past Curtis' outstretched hands. He did snag a coupon—for a free hot chocolate. That just made him more angry. By the middle of the third period, Curtis and Paige were hitting each other, Tate was asleep, and Traci was wondering when this game would ever end. In the last couple of minutes of the game, the visitors tied the score. It was still a tie at the of regulation, so the announcer shouted, "Who's ready for some BONUS HOCKEY?!" Traci's response? "Bonus hockey? Oh, boy. Hmmph." But bonus hockey was awesome. The Grizzlies scored the game-winning goal with 15 seconds left in overtime. All was well in the world. Thanks, Grizzlies! We'll see you at the Presidents' Day game. Paige got roller skates for Christmas. Tonight we decided to learn how to use 'em. My rollerblades were long since given away. Luckily my mom just gave me a pair of roller skates that she found at a deceased neighbor's house. Sweet. These days, skating rinks rent this little walkers with wheels to help kids to learn to skate. They cost $3. "Dad," I really think we should get one of those walkers. 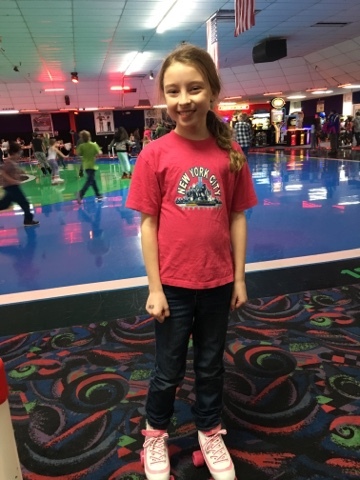 "I don't think we need one," replied the dad who had brought his daughter to $1 skate night and saved $2 by bringing his own pair of roller skates, stolen from a dead man. I laced up my skates and I stood up. And nearly fell right back down. 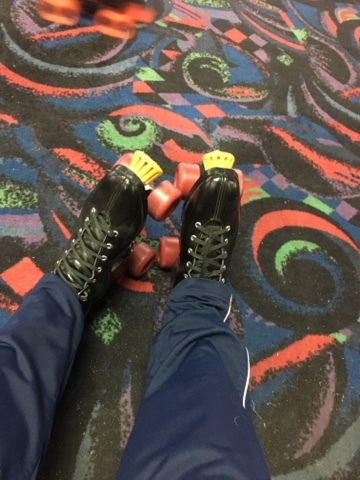 It turns out, roller skating is a little trickier than I had bargained for. We rented the $3 walker. Paige used it for the first 30 minutes or so and then told me to hang out to it, just in case she needed it. After after hour, she was ready to ditch the walker entirely. After an hour and a half, she was cruising along all on her own. And then, of course, there was a surprise visit from Princess Leia and some stormtroopers. But that wasn't even the best part. 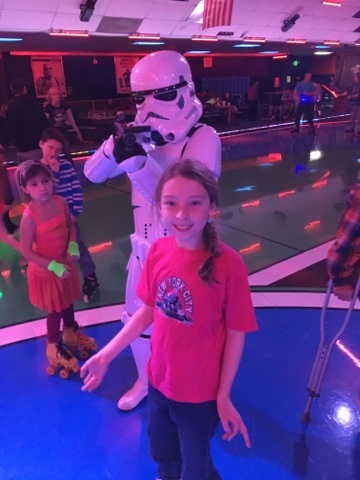 At one point, Paige had no choice but to ditch her skates to run out the middle of the rink to dance to Watch Me Whip/Nae Nae (I didn't know she had such sweet moves). And then, just when we were getting ready to leave, the DJ announced that it was ten minutes to THE BLACKOUT. "What's a blackout, Dad? Can we stay?" How I could say no? Ten minutes later, the lights were out, the fog machine was in full force, and the lasers were a-blazin'. The DJ was mixing Bieber with T. Swift and Demi Lovato with Tove Lo. What more could we ask for? 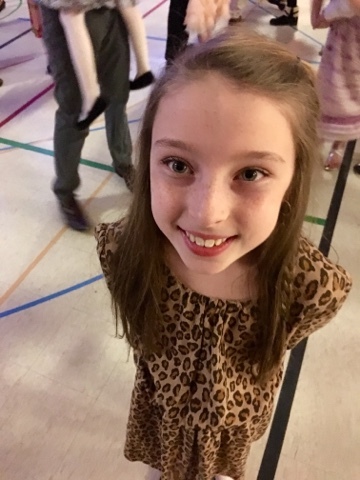 On our way out, Paige said, "Dad, did you have an awesome time? Because I had an awesome time. And can you believe that I can skate now? Wasn't the blackout awesome? When can we come back? How long were we here? Two-and-a-half hours? It went by so fast. Wasn't it awesome?" The best way to start a day. Dads & Donuts at the kids' school this morning.